The Seattle Sounders have been one of the most aggressive MLS teams about ramping up their player development program -- an "eight-figure" spend in the area, says Sounders general manager Garth Lagerwey -- and they signed their first player to an MLS contract from the group of teenagers they signed to USL contracts in the last year. 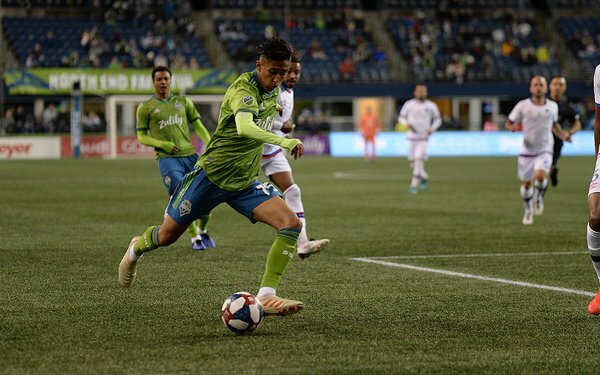 Danny Leyva, who was playing soccer in Las Vegas two years ago when the Sounders recruited him to enter its home-stay program for academy players from outside the Seattle area, signed at age of 15 on Tuesday. "This is obviously something we have worked a long time for," said Lagerwey. "It's something Danny has worked a long time for. And I think it is the first of many kids. This is proof of concept." Leyva's signing comes less than six months after he signed a USL contract with the Sounders' second team, the Tacoma Defiance. He was a key player on the Sounders' U-17 squad that won the Development Academy national Championship in July 2018 and two months later became the second youngest player to start in the USL for what was then known as Sounders FC 2. Leyva earned a first-team contract after a strong preseason with the Sounders' first team. "We took something like 12 or 13 players to preseason," Lagerwey said of the academy-age pros and other academy players, "and we kind of turn them loose and see how they do. Danny ran with it. We partnered him with Victor Rodriguez in the preseason. Victor is a very serious, quintessential pro, and I think it rubbed off on Danny. It was the right model. Danny has a great mentality for everything. I think there is some comparison to Cristian Roldan just in terms of how quickly he has assimilated and how much he wants to learn. And Danny has had the right approach, and it paid off." What stood out with Leyva was his poise. "He's very calm," said Lagerwey. "He is a central midfielder. There's always chaos swirling around all those guys, but he is very calm on the ball." He cautioned that it is too early to project what will be Leyva's best position. "He's still skinny," Lagerwey said, "so he still has some growing to do. I think you're a fool if you say at 15 years old he is going to be this, for sure, when he is 22. We don't even know what his adult body looks like. What you're taking is a skill set -- he's a central midfielder, he has the technical ability to play there, he has the aerobic ability to play there -- and you kind of let it develop. Even within his career, he started as a 10, but he has played more as an 8 recently. This season he has played exclusively as an 8, but those are things his coaches will develop and let play out. There's time." Lagerwey says he doesn't want to put up any guard rails on Levya, given how fast and unexpected his development has been. After all, he was a 13-year-old kid playing in Las Vegas just two years ago. At the same time, he said the key is for Leyva to get playing time, so calling him up to the first team and leaving him on the bench doesn't accomplish anything. Leyva attended his first U.S. under-17 national team camp that ended on Monday, and Lagerwey said it would be a wonderful opportunity if Leyva, the youngest player at the Florida camp, got to play in a World Cup this year. There are still two reserve roster spots open on the Sounders' first team. Lagerwey said other academy players on the Defiance could sign if the timing fits, but he added that Leyva was a unique case. "Danny is special," he said. "There is a reason he was the first one over the finish line. He is a special talent, he is the right personality. He is very poised and mature for his age. Each kid has to make his own path." 2 comments about "Sounders' Garth Lagerwey on what makes 15-year-old Danny Leyva a special talent". John Soares, April 10, 2019 at 4:27 a.m. Sounds like a "kid" with a bright future. Hey Mr Lagerwey, how about a replacement for Dempsey. beautiful game, April 10, 2019 at 9:41 a.m.
Why would anyone talk about Leyva's future position at this stage? Who cares...let the kid develop. Hopefully, as he physically grows, the calmness and efficacy doesn't start to slide because of coaching decisions; i.e., Giuseppe Rossi as an 8-year old filled out physically, but always maintained consistent high technical & tactical standards from U-ball to his professional career in Europe.